^ a b c d e Sun, W. (1998). 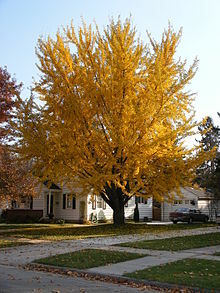 Ginkgo biloba. The IUCN Red List of Threatened Species 1998: e.T32353A9700472. doi:10.2305/IUCN.UK.1998.RLTS.T32353A9700472.en. Downloaded on 29 July 2018. ^ a b c d e f ﻿Herbs at a glance - Ginkgo﻿ (Report). アメリカ国立補完統合衛生センター. (2016-09). https://nccih.nih.gov/health/ginkgo/ataglance.htm.